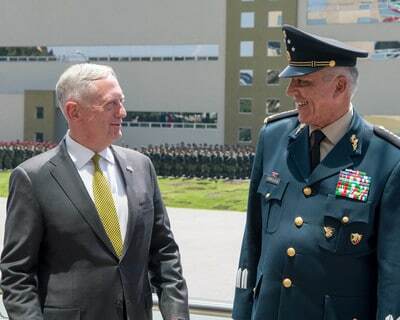 Democracy is succeeding in Latin America and can be a beacon to the rest of the world, Defense Secretary James N. Mattis said yesterday at the Defense Ministerial in Cancun, Mexico. The Conference of Defense Ministers of the Americas, co-hosted by Mexican Secretary of National Defense Gen. Salvador Cienfuegos Zepeda and Mexican Secretary of Navy Adm. Vidal Francisco Soberon Sanz, allows defense ministers from Canada to Chile to gather and discuss shared hemispheric defense challenges. The forum was founded by then-Defense Secretary William J. Perry. Mattis said there are challenges to stability and security in the Americas, from transnational criminal syndicates to illegal immigration to humanitarian issues. Partnership among the nations of the hemisphere is crucial to addressing these challenges, he said. Cuba, Nicaragua and Venezuela are the exceptions to the rule in the region. Mattis called the leadership in Cuba “sad and unresponsive.” Nicaragua and Venezuela tried to model their countries after Cuba. But the nations, “cannot hide from the reality they face as the world recognizes that the Cuba model no longer works for anyone, even Cuba,” he said. Mattis noted the decision to send the hospital ship USNS Comfort is one example of cooperation. The ship will help relieve the strain on local health care systems overburdened by caring for refugees from Venezuela. “We note that in the midst of … this man-made disaster in Venezuela that Russia is sending a bomber, while the U.S. Navy is sending a hospital ship with doctors,” he said. The Comfort’s medical staff will come from the U.S. Navy, as well as Mexico and other area countries.